Red Bull Music Academy and Degree One are proud to welcome experimental producer Flying Lotus on Sunday, July 5, 2009 at Element Nightclub in Victoria. Since 1998, Red Bull Music Academy has seen over 500 lecturers and 600 emerging music makers walk through its doors, studios and stages, with past annual editions landing in culturally rich cities such as Berlin, Dublin, New York, London, Sao Paulo, Cape Town, Rome, Seattle, Melbourne, Toronto and Barcelona. As a participant of the 2006 edition in Melbourne, Flying Lotus serves as a shining example of what Red Bull Music Academy hopes to achieve. A work of bass-driven metaphysics, Flying Lotus’ Los Angeles could have been regarded as a lone dispatch from a distant musical plane. Instead it has struck an ultimately resonant chord with everyone from the indie pack to Massive Attack, soul heads and Portishead, as well as music critics across the globe as well as Radiohead, who tapped Flying Lotus to remix “Reckoner” from In Rainbows. With praise coming from every direction it would seem easy for Flying Lotus to rest on the strength of his accomplishments, however he’s doing no such thing. In the wake of Los Angeles release, he was hard at work in the lab putting the finishing touches on a series of LA EPs as well as remixes for Stereolab, Blank Blue and the aforementioned Radiohead. LA EP 1X3 reprised a pair of album tracks alongside mind-blowing new jams like “Rickshaw” and “Paper Crane Gang” while LA EP 2X3 sees tracks being remixed by Martyn, Samiyam, Nosaj Thing, Ras G and others. The third EP in the series remains a mystery, but rest assured it will be an excellent prelude to Flying Lotus’ installment in the seminal DJ-Kicks mix series next year. The complete run of Red Bull Music Academy Flying Lotus dates in Canada includes July 5 in Victoria @ Element, July 7 in Whistler @ Maxx Fish, July 8 in Calgary @ Hi-Fi, July 9 in Toronto @ Tattoo, July 10 in Ottawa @ Babylon, July 11 in Montreal @ SAT and July 12 in Vancouver @ Shine. 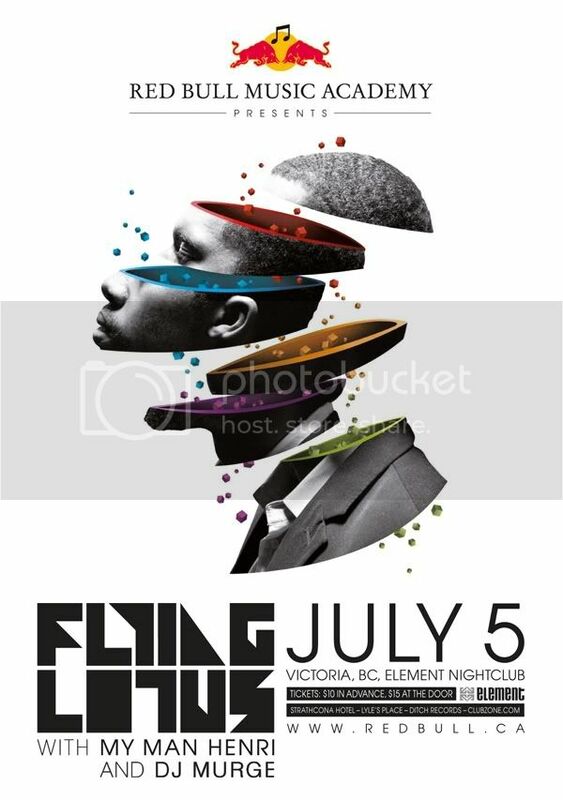 Don’t miss your chance to catch Flying Lotus on Sunday, July 5, 2009 at Element Nightclub in Victoria.